3. Excellent anti-UV performance, Super flexibility and elasticity. 5. Can be used in wide application temperature scope (- 40`C~+120`C). 6. Excellent self- adhesive backing. 7. Easy to install ,decorative, seals firmly, excellent wearable. 8. Good tight dimensional tolerances and have excellent compressability,elasticity and adaptability to uneven surfaces. Our Producing Supply Capacity:4,500,000 meters per month. 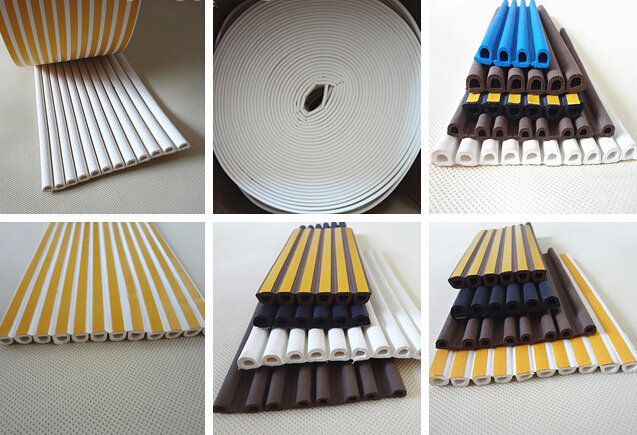 1.Quality of high demand custom rubber strip door seal : high quality with low price. 2.Develop new high demand custom rubber strip door seal : your drawing ,design, sample etc are available. 3.Production capacity of high demand custom rubber strip door seal : 300,000 m /month. 4.Delivery port of high demand custom rubber strip door seal : Tianjin;Qingdao;Shanghai;Guangzhou . 5.Reply your inquiry in 24 working hours. 6.customized design is available,OEM & ODM are welcomed. product service: we can make mould by your drawing or sample! after sale: we guarantee 2 years,we replace demaged product by free if in the period! We can produce silicone,epdm,tpe,eva,cr,nr,pvc material for you. We can produce car door and trunk weatherstrip,car door and widnow rubber seal,auto windshield weatherstrip for you. We can produce door and widnow rubber seal strip for you. We can produce rubber extrusion and rubber mould products for you. Any shapes ,sizes and colors are available. Welcome to visit our factory and do business with us.